$22.95 USD 9.5 x 10 inches softbound. Nature tells stories that unfold over time, and the evidence is all around us--in the shape of a rugged coastline, in the growth of a tree's rings, in the beautiful banded strata of an ice cave. The latest book from The Exploratorium, San Francisco's acclaimed hands-on science museum, combines William Neill's award-winning photography with accessible scientific observation to illuminate an ever-changing world. 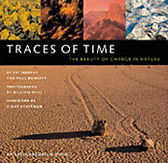 Examining nature in segments of time ranging from a fraction of a second to millions of years, from the bloom of a plant to the carving of a canyon, Traces of Time reveals how to measure the forces of nature and the ways they affect our planet. A powerful portrait of the natural beauty of our world, this gorgeous blending of art, science, and photography offers a new perspective to anyone who has ever gazed at the world in wonder. Pat Murphy, director of publications at the Exploratorium, has written extensively about scientific phenomena, translating complex ideas into accessible language. Paul Doherty is senior scientist at the Exploratorium Center for Teaching and Learning. William Neill is a renowned landscape photographer and winner of the Sierra Club's Ansel Adams Award for nature photography. Diane Ackerman, a poet, essayist, and naturalist, is the author of the best-selling A Natural History of the Senses.